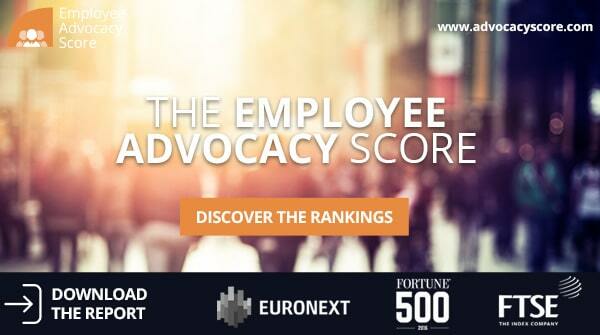 The Employee Advocacy Score (EA Score) is a unique ranking that allows companies to measure employee advocacy. This is done by gauging the critical relationship between internal employee engagement and external brand visibility. EA Scores for the top 100 Fortune and FTSE companies, as well as those listed on the CAC 40 (EuroNext) index, have now been revealed. The EA Score uses a combination of employee metrics and social listening to determine a score between 0 and 100. So, the higher a company’s employee engagement and advocacy level, the higher their EA Score. Also, data taken into consideration includes employees’ activity on Twitter and LinkedIn, and their level of engagement with their company on those networks in the form of mentions and identified industry keywords. The EA Score website also enables non-indexed companies with at least 5 000 employees to request their Employee Advocacy Score. Complete with resources on employee engagement, advocacy and digital transformation, the website includes a dynamic Social Wall, which aggregates relevant content from across the web. Sociabble is the leading provider of social selling and employee advocacy software. Additionally, our unique platform organizes brand, third-party, and user-generated content onto themed channels. From these channels, users can share on social media and track subsequent traffic and lead generation. Available natively for Android, iOS, and Windows Phone; Sociabble also features include gamification, newsletters, calls-to-action, advanced analytics, lead tracking, and individual performance dashboards. The platform also integrates with a number of CRM, curation, listening and retargeting tools, including Office 365, Salesforce, and RadiumOne. Used in over 60 countries, Sociabble’s client base includes companies from multiple sectors. Including energy, tech and communications, finance, government, education, and media. Contact us to find out more about the Sociabble social selling and employee advocacy platform, or to arrange a demo.